Researchers at University of California San Diego School of Medicine have developed a microbial detection technique so sensitive that it allows them to detect as few as 50-100 bacterial cells present on a surface. What's more, they can test samples more efficiently — up to hundreds of samples in a single day. The technique was validated by sampling hundreds of surfaces in three different environments: the Spacecraft Assembly Facility at NASA's Jet Propulsion Laboratory at California Institute of Technology; the neonatal intensive care unit (NICU) in Jacobs Medical Center at UC San Diego Health; and an endangered white abalone rearing facility at National Oceanic and Atmospheric Administration (NOAA)'s Southwest Fisheries Science Center in La Jolla, Calif. Details of the technique, called KatharoSeq, are published March 13 in the journal mSystems. ("Katharos" is Greek for "pure," and "Seq" is short for sequencing.) KatharoSeq has already revealed new insights about the three testing sites that could help optimize how the Mars 2020 Rover is assembled, how bacteria are tracked in hospitals, and how endangered white abalone are raised and returned to the wild. "The more we know about the microbial communities in a given environment, the more likely it is we can reshape them to improve environmental and human health," said senior author Rob Knight, PhD, professor of pediatrics and computer science and engineering, and director of the Center for Microbiome Innovation at UC San Diego. 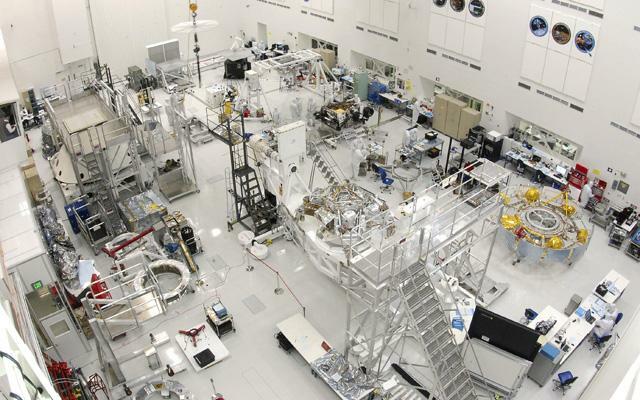 The Spacecraft Assembly Facility at Jet Propulsion Laboratory is where NASA builds spacecraft and machinery to be launched into space. Engineers and staff must account for every biological organism sent into space in order to prevent contamination of other planets. In this part of the study, Knight's team wondered if KatharoSeq might be able to detect microbes in what is thought to be a sterile facility. Of the three sites tested, the Spacecraft Assembly Facility had the lowest microbial diversity. But bacteria were still present — KatharoSeq detected 32 types. The most abundant type was Acinetobacter Iwoffi, which is associated with human foot traffic. Knight's team will now work with Jet Propulsion Laboratory staff to create a map of the microbes living in the facility over the next six months, including the Mars 2020 Rover. Their goal is to send a sterile rover to Mars. The NICU at Jacobs Medical Center at UC San Diego Health is relatively new — the 245-bed advanced specialty hospital opened in La Jolla in late 2016, about four months before samples were collected for this study. The 52-room NICU was designed to give each baby and his or her family a private room, with the idea that it would not only provide a better patient experience, but also prevent the spread of infection among this vulnerable population. In this study, the NICU samples contained more bacterial species than the Spacecraft Assembly Facility, but fewer than the white abalone rearing facility. Consistent with other hospital findings, the researchers using KatharoSeq found that staphylococcal bacteria were the most prominent type in the facility, the majority of which were the harmless skin resident Staphylococcus epidermidis. The NICU has two sections — one with higher acuity (a higher health care provider-to-patient ratio) and one with lower acuity. The team found more staphylococcal bacteria on the surfaces of the high acuity wing, which at the time of the study correlated with a higher culture rate in that area (six positive cultures in 14 high-acuity rooms, vs. six in five of 37 low-acuity rooms). Using KatharoSeq, surfaces in one of the NICU rooms tested positive for the bacterium Serratia marcescens. Unbeknownst to Knight's team at the time, the infant staying in that room had had a lung infection with that bacterium. But they noted that the bacteria were absent from the rooms on either side, supporting the assumption that private patient rooms provide a barrier to infection. "All hospitals have bacteria," Knight said. "But this is the kind of information we don't yet have — which bacteria are found where, and for how long. Pathogen monitoring currently requires taking samples from patients and sending them to be cultured, where lab technicians wait to see which bacteria grow in a petri dish. Being able to monitor and predict pathogens by routine, noninvasive sampling of the built environment and sequencing to identify the bacteria, rather than waiting for cultures to grow, could be a useful approach for identifying potential hotspots of transmission that are currently unknown." In the future, co-author Jae Kim, MD, PhD, associate clinical professor of pediatrics and nutrition medical director of the Supporting Premature Infant Nutrition Program, and his team hope to investigate probiotic interventions in the NICU. They want to know if treating patients with beneficial bacteria might help prevent colonization with pathogenic bacteria over time, both on the patient and within the built environment of the room. NOAA's Southwest Fisheries Science Center raises endangered white abalone to help reestablish their populations in the wild. These shellfish were the first marine invertebrate added to the endangered species list — in the late 1990s. Since their populations have declined in part due to a withering syndrome caused by a type of Rickettsia bacteria, infection control is vitally important to the rearing facility, particularly when abalone are transferred in from other aquariums. The white abalone tank receives seawater that has been UV-treated and filtered. In this study, KatharoSeq detected a diverse microbial community in the white abalone tanks. The researchers found many types of marine bacteria, including symbiotic species that may help the fish digest algae. The white abalone had more bacteria in common with their surrounding environment than with the nearby red abalone. But researchers did not detect any of the troubling Rickettsia. Going forward, Knight's team hopes to work with the rearing facility to determine the optimal microbial make-up of the white abalone and its surrounding environment to improve transplantation success. "When it comes to human and environmental health, sterile is not necessarily better," said co-author Russ Vetter, a senior scientist at NOAA Southwest Fisheries Science Center. "We want to compare wild and aquarium-raised abalone, and better understand how an aquarium-raised abalone's resident bacteria help or harm them once they are released into the ocean. Do they need a probiotic bath before release, or will a different diet to help prepare them? We don't know yet." Technical details. The first author of this study, Jeremiah Minich, a graduate student working on his thesis in Knight's lab and in the lab of Eric E. Allen, PhD, associate professor at UC San Diego Scripps Institution of Oceanography, swabbed each of these sites while wearing protective gowning and gloves to avoid unintentional contamination of the environments. He took the samples back to the lab on dry ice, then ran them through the typical microbial DNA sequencing protocol: extract DNA from the samples, amplify microbe-specific "barcodes" known as 16S rRNA using a technique called polymerase chain reaction (PCR), run them through a sequencer and analyze the data. What's new in KatharoSeq is that Minich integrated a sample pooling strategy, appropriate positive and negative controls, high-throughput DNA extraction and a magnetic bead-based DNA clean-up approach. Most researchers pass their samples through a filter in a column to purify DNA before sequencing, but Minich and team found that a lot of material is inadvertently lost that way. With KatharoSeq, the researchers improved their level of microbial detection by about two orders of magnitude and increased the rate at which they can process samples about five-fold, as compared to standard sampling and sequencing methods. "We can get results as quickly as 48 hours after receiving a biological sample," Minich said. "And we think we could do it even faster once we scale it up and incorporate more automation into the KatharoSeq process." Study co-authors also include: Qiyun Zhu, Stefan Janssen, Amnon Amir, Megan M. Doty, Kristina Stillwell, UC San Diego; Ryan Hendrickson, James Benardini, Kasthuri Venkateswaran, Jet Propulsion Laboratory, California Institute of Technology; and John Hyde, NOAA Southwest Fisheries Science Center.